This article describes the workflow of opening, saving and closing files using Content Station Web. When using Content Station AIR, see Opening, saving and closing files with Content Station 9 AIR. Select the file and choose File > Open > Check Out Only.. Select the file, right-click it and choose Check Out Only.. Step 2. Click Save and browse to a location somewhere on the system and save the file. 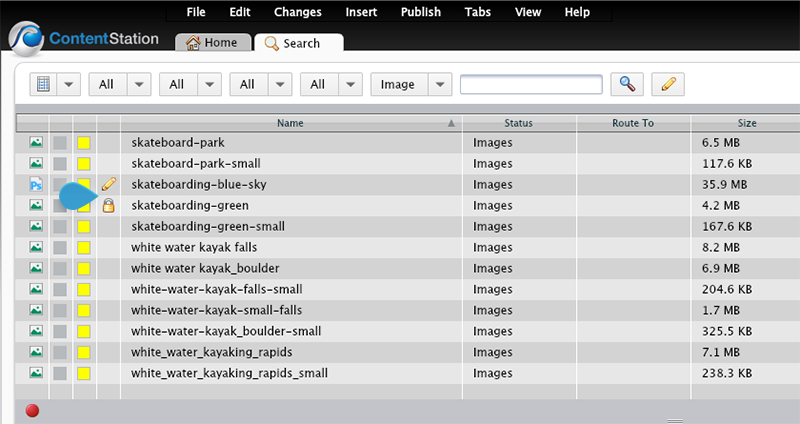 Figure: Files that are checked-out can be recognized by their icons in the Document pane. Step 3. Access the location where you saved the file to and double-click it to open it in its own application. Note: In Content Station Web, no icons appear to make you aware of this difference. Step 2. Return to Content Station and locate the file that you have checked out. The Windows Explorer / Mac Finder window appears. Step 4. Browse to the location where you saved the file and click Open. The file is checked-in and closed. It is now available for other users to edit it. Note: The originally checked-out file is not removed from the system. The file is made available for other users to edit it.